"Fly Fishing For Trout Personal Checks" product is already in your cart. Fly fishermen and women will enjoy using these Fly Fishing For Trout personal checks from Bank Checks Now when dealing with daily finances and other check writing duties. Fly fishing for Brown, Brook, Rainbow, and Lake Trout is a fishing pastime almost anyone can learn and enjoy. Fly Fishing equipment doesn't have to be expensive and can be kept to a minimum. As a trout fishermen your going to need a fly fishing rod, fly reel, fly fishing casting line, tied flies or lures, a dip net, some waders, and a fly fishing vest that holds your small tackle box and some misc. items. Many streams, brooks, and rivers hold various species of trout that be caught when Fly-fishing for them. Imagine enjoying a peaceful day fly casting with your rod and reel into a flowing streams waters anticipating the bite of a nice Brown, Brook, Rainbow, or Lake Trout. Now you can catch the experience of trout fishing with a fly rod with your own personal bank checks honoring trout fishing. Order your new Fly Fishing For Trout personal bank checks today and save money that can be used for trout fishing. Save up to 50% or more over the high prices that banks charge for new checks and any re-orders. 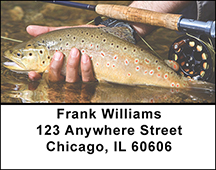 Complete your Fly Fishing For Trout check order with matching address labels and a coordinating check book cover. Save now!